how to spot a fake epiphone les paul custom? Sounds sketchy if the #s are scratched out. Does it look like it was done deliberately? yea. is there anyway to find out for sure if its a fake? also, the truss rod is blank and does not say gibson? is that a sure giveaway? Is it marked "2nd" or "USED" on the headstock? I recall people mentioning that the serial numbers are scratched out on these instruments for warranty service. Or lack of it due to it being a 2nd or used. PS: As for the TRC, being blank doesn't mean a thing. Actually, most new Epiphones say the model name on the TRC, rather than how the old ones said Gibson. EE means it is manufactured in QingDao's factory from China. But I don't know why your numbers are scratched out. Maybe you can post a picture or two so the people here can help you out? They helped me out with mine when I posted the picture of my 'rusty' G400. It was thanks to this forum that I asked for my G400 to be reconditioned by the store I bought from. My MIK I model Les Paul Custom dates 03 and has the Gibson truss cover not the Model name. Also the truss cover seems to be a tad taller than other LP truss covers and nearly touches the split diamond inlay. Mine doesnt have a 2nd or used mark anywhere on her. You have a "used" or "2nd" there...just means there was some little something wrong and it got sent back for a refurb, or there was some small blem in the finish. The last of the serial number was rubbed out so it couldn't be sent back to the factory under warranty. 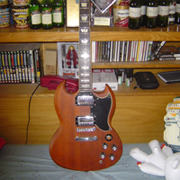 As for telling a "fake" or "counterfiet", if it has Epiphone on it then it is a fake...not worth a nickle! so I'll give all you with the "FAKES" or, who think they have a one, 20 bucks apiece for them just to get em off your hands...you won't want anything but the real thing cluttering up your house would you? One sure way to tell is if it is counterfiet is if the strings reach from the tuning pegs to the bridge...bound to be a fake...they are all fake I tell you...all of them! ps....think I like the "which is better" and "why do they cost so much more" post for Gibson verses Epiphone!